Today, November 11, is the anniversary of the end of the First World War. In France the Jour de L’Armistice or le Jour du Souvenir is a day of military parades and ceremonies. But there is more to remembrance than marchpasts and bugles. 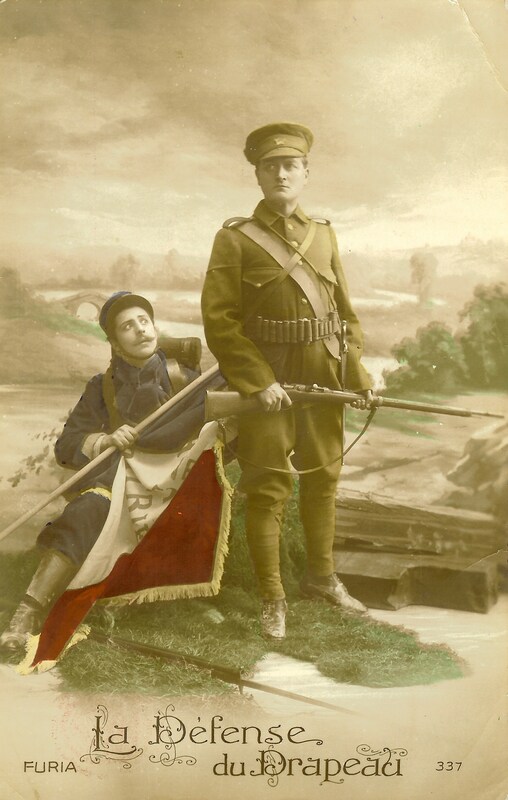 A few months ago, I bought six First World War postcards at an open-air antiques sale near the Bastille. 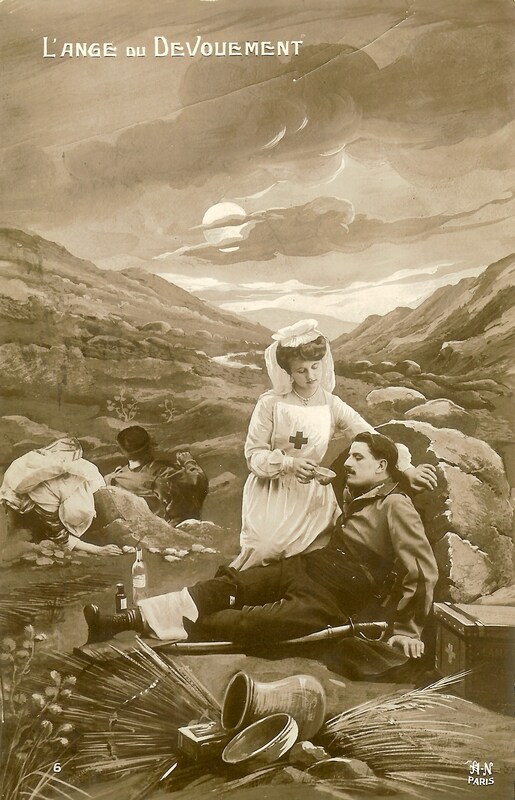 The cards, dated 1914 to 1916, showed patriotic or sentimental images specifically created for wartime correspondence. The patriotic ones showed soldiers expressing devotion to France’s flag; the sentimental ones were of wounded men being treated by angelic (and slightly improbable-looking) nurses. What caught my attention was that all six had been sent to the same address in Montreal: 1759 Park Avenue. Clearly, the postcards had formed part of a long-ago collection. I wish I had taken the time to search for others from the same source. However, the six I did buy provide brief glimpses of a family in wartime. I decided to find out what I could about the people who had sent and received these cards. It took me some time to track down the address. You won’t find 1759 Park Avenue on Google Maps, because the street numbering has changed since 1915. But thanks to the Bibliothèque et archives nationales du Québec, I was able to look at street maps of Montreal dating from before the First World War. I found that 1759 Park Avenue corresponds to what is today 4859 avenue du Parc. The building still stands – a typical Montreal walk-up brick row house with lots of stairs in front. The surname that appears on the cards is unusual – Bernigaud. 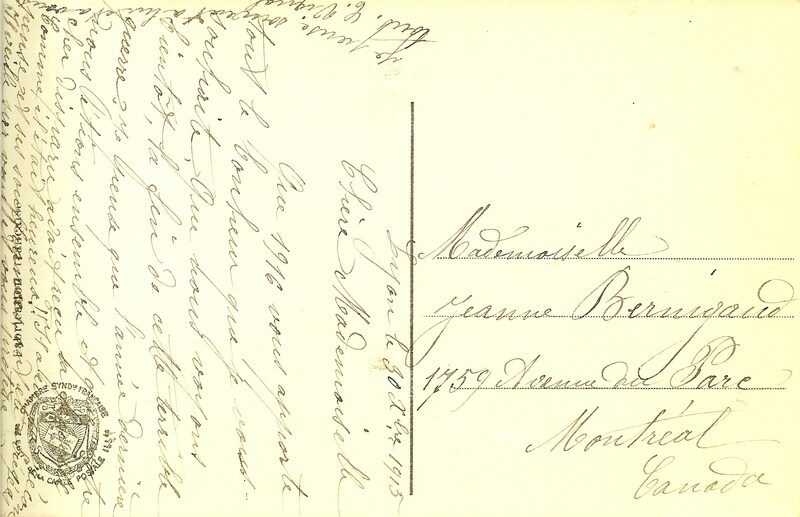 Of the six cards, one had been sent to Louise Bernigaud and the rest to Jeanne or J. Bernigaud. Having two names instead of just one made it much easier to trace the family. Louise and Jeanne were sisters and I found the whole Bernigaud family on a genealogical website. There were seven children: Louise was the eldest, followed by Henri, Philippe, Jeanne, Jean, Marie, and Paul. Their parents were Joseph and Marie. They came from Charolles, in the department of Saone-et-Loire, part of the Burgundy region. The family had left France in 1907 to come to North America (via the United States), and by late 1914 they were living in Montreal. I spent some time deciphering the handwriting and peering at postmarks. The first postcard (chronologically) was sent at Christmastime in 1914, from one Yvonne Michaud to Louise Bernigaud. 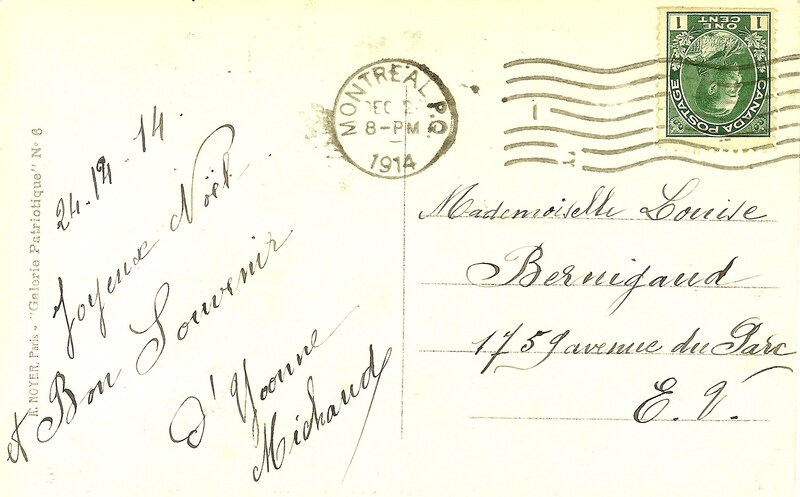 It was posted in Montreal and contains the brief message “Joyeux Noël et Bon Souvenir.” There were several Yvonne Michauds in Montreal at the time. So no clues there. 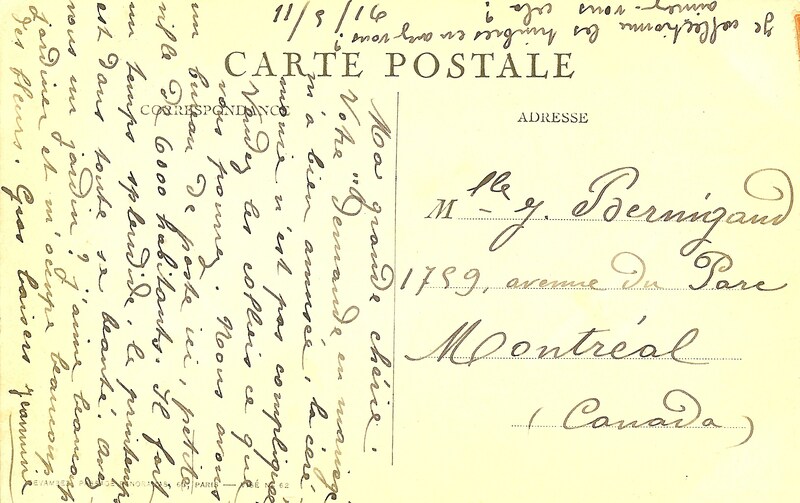 The second was posted in Lyon Terreaux (one of the Lyon post offices) in July 1915 by someone called Jeannine, and was addressed to Jeanne. 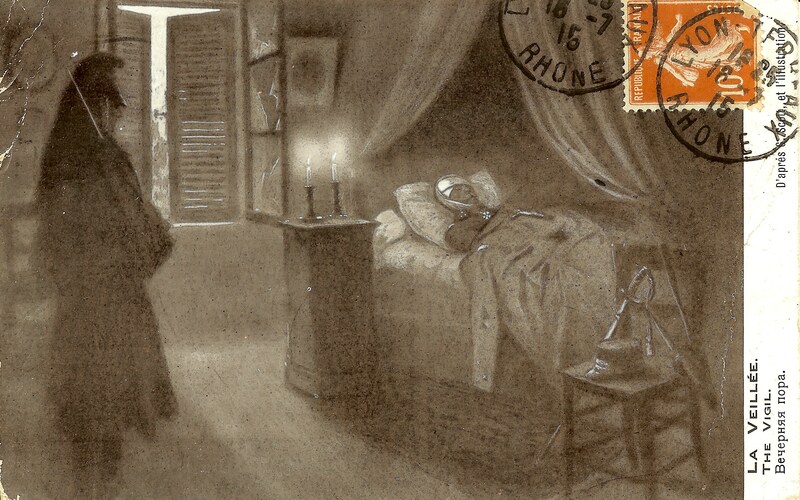 The sender, Jeannine, seems to have been working in a French hospital in Lyon (perhaps the Hôpital Desgenettes, a military establishment). She thanks Jeanne for taking an interest in “her soldiers.” She mentions that her uncle is suffering from tuberculosis brought on the previous winter by the severe cold. (So many people died of tuberculosis in those days; it was one of the leading causes of death.) Her cousin Albert has been evacuated from a hospital in Perpignan. Alas, since I do not know her last name, I cannot find out any more about Jeannine. 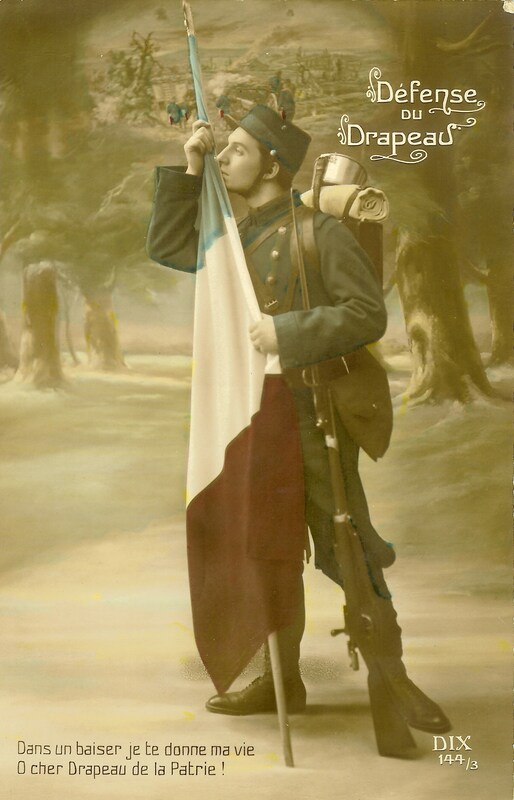 The third postcard is also addressed to Jeanne Bernigaud from Lyon, sent in December 1915, but this time, the sender was one C. Vignal. The writer alludes to a loss in the family. I hope 1916 brings you the happiness you wish for. I hope we see each other soon, at the end of this terrible war. I think how we were all together a year ago and that your dear departed had just received his papers. How happy he was! He had his reward and his sufferings were brief. He is watching over you and protecting you. I often think of him and of you. Que 1916 vous apporte tout le bonheur que je vous souhaite. Que nous voyons bientôt, la fin de cette terrible guerre. Je pense que l’année dernière nous étions ensemble et que votre cher disparu avait reçu sa feuille. Comme il était heureux ! Il a eu sa récompense et ses souffrances été abrégés. Il veille sur vous et vous protège. Je pense souvent à lui et à vous. At first I wondered if Jeanne Bernigaud had lost a fiancé, but as I continued my research, a different story emerged. All but one of the members of the Bernigaud family were mentioned in postwar records of various sorts. Philippe was missing. At the French Defence Ministry website I found the record. Philippe Jean Marie Bernigaud had died at Souchez, near Vimy Ridge, on June 12, 1915, as the result of enemy action. He was 20 years old. Canadians will immediately recognize the name “Vimy Ridge.” So many Canadians died during a later battle there (1917) that the Canadian government erected a monument to Canadian soldiers. I have visited the memorial, and was moved by its stark shapes and extraordinary vista towards the east. It has recently been meticulously restored. Who was the author of this message, C. Vignal? There is a clue on the card. “We were all together a year ago.” I doubt that the entire Bernigaud family had returned to France. More likely C. Vignal had been in Canada. I found a Catherine Vignal who had come to Canada before the war with her husband Henri and had been counted in the census of 1911 there. She had been born in the early 1860s, which would make her in her early 50s at this point. A possibility, but I’m really only guessing. Card No. 4. The message is addressed to Jeanne, written in pencil, and signed “Michaud.” There is a loop through the word that might make it “C. Michaud.” A relative of Yvonne Michaud? Or just another person with a fairly common last name? There is no stamp or postmark. It is dated 14 January 1916. The sender apologizes for not having written earlier, and sends good wishes for the New Year for Jeanne and her family, with the hope that the entire family would soon be reunited under one roof. Card No. 5 is also from C. Michaud, also in pencil, and dated about a month later. Michaud has received good news of Henri (Jeanne’s older brother, who would have been about 23 then). Neither of Michaud’s cards has a postmark. They might have been sent in a packet with other letters. Perhaps C. Michaud enclosed the card in a letter to a relative (Yvonne?) in Montreal, who delivered it by hand. Despite the lack of a postmark, I believe they were sent from France. There is a record of Henri sailing from France to New York at the end of 1916, so I assume that he was in France when C. Michaud wrote the card and therefore that both Michaud’s cards were written from France. 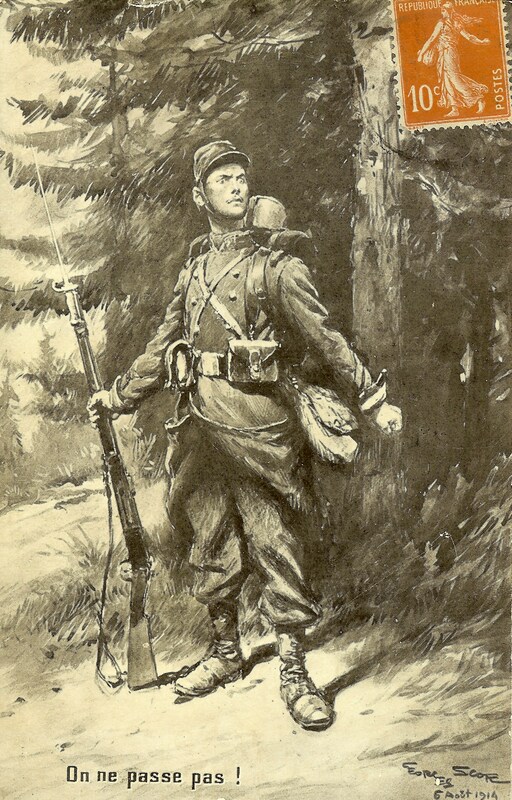 Was Henri also a soldier on active service? The ship’s manifest lists him as a “clerk.” Perhaps he was a clerk in the military? I wonder why he was returning to Canada. The tone of both messages is very formal and respectful, so I’m guessing that Michaud is a young man, and a soldier, like the ones shown in the pictures on the cards. The use of pencil suggests he may have been writing from the field. I wonder what happened to him. On the French Defence Ministry site I found records of 26 people with the last name Michaud and the initial C who had died in the Great War. Many others with the same initial and last name may have survived the war and are not counted among the records of the fallen. The last of the six postcards is from Jeannine again. It is stamped, but the postmark is too faint to read. The message is dated May 1916. Jeannine says she is now in a small town of 6,000 souls, but hastens to reassure Jeanne that it has its own post office. She mentions that the spring weather is good and speaks of her interest in gardening and stamp collecting. Part of the message is cryptic. I found your “marriage proposal” very funny; the ceremony is not complicated. Sell the necklaces which you can. Votre « demande en mariage » m’a bien amusée, la cérémonie n’est pas compliquée. Vendez les colliers ce que vous pourrez. What was that all about? Jeanne might have sent her friend an amusing story about a proposal, or she might have received a proposal herself that she described in an amusing way. And selling necklaces? A mystery. That is all. Thanks to ancestry.com, I was able to follow the Bernigaud family for a few years after the war. Jeanne returned to France, and in 1922 is living in Autun, not far from her birthplace. Her older sister Louise visited her there, but returned to Canada with their brother Henri on the S.S. Melita. Henri went into business of some sort. Jean trained as a pilot. Paul was a mechanic. Marie became a secretary and worked for the wife of an eccentric New York millionaire. Their mother, who may have been widowed by the 1920s, was living in Charenton outside Paris in 1931. But there the trail goes cold. There is something extraordinarily compelling about these bits of paper that are still fresh and readable almost a hundred years after they were mailed. They were saved as a group, eventually they were sold, and they made their way into the hands of a dealer. They travelled from France to Canada, then they went back to France, and now I have returned them to Canada. Fragile, easily destroyed, yet somehow persisting into the 21st century, they continue to bear witness to the story of one French family in wartime. This entry was posted in Paris history, Paris postcards, World War I and tagged Armistice Day, Bernigaud family, First World War, French postcards, Henri Bernigaud, Jeanne Bernigaud, Jour de L’Armistice, Jour du Souvenir, Louise Bernigaud, Lyon, Montreal, Remembrance Day, Veterans Day, Vimy Ridge, World War I, Yvonne Michaud. Bookmark the permalink. Very interesting post. Amazing what you discovered about the cards. This was fascinating. 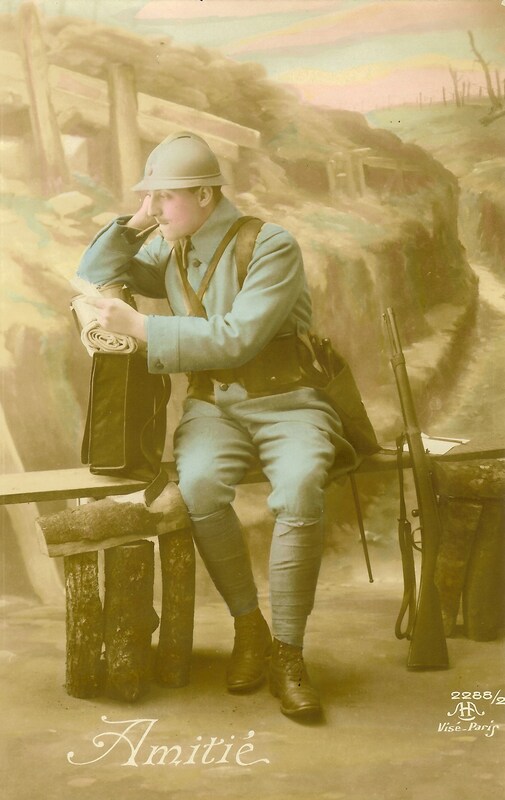 A few years ago, one of my great-uncle’s letters was placed in a military museum in France. He died there at Christmas 1914. He’d been so eager to join up, he’d lied about his age. He was just a kid, with horrible spelling and grammar. Such a waste. Wonderful, *wonderful* post! I am very impressed by your meticulous research — and even more so with your vivid retelling of your findings. Thank you for a most enjoyable read! Indeed, we should always look on the occasion as a commemoration of the outbreak of peace. for the efforts made in your research……I appreciate ALL your stories….but this one is the BEST ! What an interesting bit of detective work! My daughter (14 then) and I went to Arras in Northern France to find the grave of a Great Uncle (English) killed in Battle and buried near there. We stayed in an inn where the basement and excavated trenches were still intact. The basement had been used as a hospital and was covered in graffiti. Along with visits to museums in the area it certainly brought to life the horrible conditions those poor men faced. So many people suffered through that war. Those post cards bring some of it back to us. Thanks for your story. Once again you amaze and delight me by the thoroughness of your research – a poignant article which really moved me. Thank you once again. What a beautiful post, Philippa. The extent of your investigating is impressive and the results weave a touching history. It was a pleasure to meet you at the workshop and I’m going to e-mail you (finally!). The beautiful handwriting on these cards was a reminder of a quickly fading art.